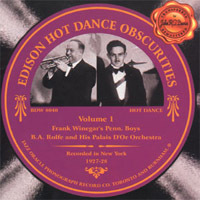 This release includes the hot recordings made in 1927 and 1928 by Frank Winegar’s Penn. Boys and B.A. Rolfe’s Orchestra for the Edison Company. Frank Winegar (bjo,g,uke) directing probably: Norman Moran-Herman Drewes (t), Bill Drewes (tb), Frank Sollecito (Salto) (as,ss,bar), Joe Linden (cl,as), Larry Hart (cl,ts,bar,pic), Ernie Watson (saxes,arr), Elliott Russell (vln), Bill Haid (p,arr), Billy Wolfe (bb), Don Nyer (d), unknown (v). Tony Franchini (p) replaces Haid. Elliott Russell (vln) omitted; Jimmy Granato (cl,as) replaces Sollecito; Frank (or Mike) Widmer (bjo) added; Bert Dixon (v). Same personnel as tracks 1-3; Arthur Hall (v). Same personnel as track 4. B.A. Rolfe (t) directing a band with instrumentation of 2 other (t), (tb), 2 (cl,as,f), (cl,ts,bar), (vln), (p), (bjo), (bb), (d) drawn from the following collective personnel: Pete Capodiferro-Vina Bono-H. Berkin-Frank Korminsky-Joe Lindwurm-Phil Napoleon (t), H, Green-Charles Harris-Dave Boyd (tb), Andy Sannella-George Napoleon-Ross Gorman-Fred Hartman (cl,as), Lucien Smith-Harold van Emburgh (cl,ts), Walter Edelstein-Billy Artz-Enric Madriguera-Fritz Forsch-Harry Salter-Pete Eisenberg (vln), Milt Rettenberg (p), ?Tony Colicchio (bjo), Gus Helleberg-John Helleberg-Cy Harris (bb), Fred Albright-William Dorn (d). Unknown (whistling) on this track.